Ten years ago, India’s most popular stand-up comedy show was The Great Indian Laughter Challenge and English stand-up was yet to find its footing in the country. Hindi comedy, buoyed by the success of sketch shows and talent hunts, ballooned into a spectacle for the masses, with big names performing side-by-side with A-list celebrities. English comedy, meanwhile, took baby steps with the support of the newly-emerging millennial demographic until it stumbled upon a fall-back business model – YouTube channels and social media accounts. English and Hindi comedy was as different as could be, and while there have been a few attempts to bring out the best of both worlds, none have been as delightful as Zakir Khan’s Haq Se Single. The Amazon Prime Video special perfectly encapsulates what it’s like to be in a modern-day relationship (with nods to texting etiquette, pretending to enjoy certain types of food and clichéd break-up texts) but is told in conversational Hindi, bringing out humour in the way only conversational Hindi can. The special focuses on two of Zakir’s most important relationships and (spoiler alert) their untimely demises. The first act takes takes off slowly, but once you’re accustomed to the language and pace, the second and third acts are breezy. This is especially commendable because they’re interspersed with shaayari, philosophy and life lessons. Zakir narrates the incidents as casually as that friend of yours who’s always falling in love, and is both endearing and notorious for the way he does it. The stories are the highlight of the show and one about Gangs of Wasseypur is particularly funny. Regardless of where you grew up, the stories about Zakir’s relationships are relatable and more importantly, real. From gaining the upper hand in Facebook Messenger conversations with old flames from school to being in a live-in relationship and enjoying the freedom of sitting around in boxers eating maggi and watching old cricket matches while your partner is away, and knowing someone well enough to trigger emotional reactions through texts to trying not to be pathetic in the face of a recent break-up, Zakir’s observations about modern-day dating will have you vigorously nodding your head in agreement. You can hear the ‘aww’s, ‘oooh’s and ‘aaah’s from the crowd as each story progresses. The storytelling is fairly straightforward and doesn’t always feel like stand-up comedy. There are not a lot of structured pauses or conventional lead-ups to punchlines, which is why the show requires a more focussed viewing than other specials we’ve seen this year. 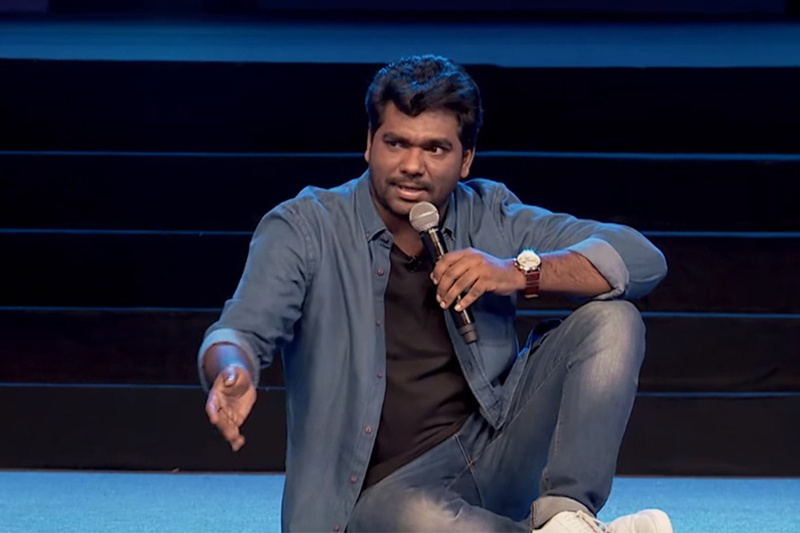 Haq Se Single is the last of Amazon’s 14 stand-up specials, and arguably one of the best. Last month, I had the pleasure of reviewing Hasan Minhaj’s Homecoming King – a heartwarming story about an immigrant teenager falling in love with an American girl and having to deal with casual racism. One of the few critiques I had was that at times it felt a little too self-indulgent. There are moments where Hasan pauses for seconds to build up suspense, looks straight into the camera and delivers a dramatic monologue while the screen behind him shows a melancholic backdrop. But Zakir tells stories with the same amount of heart while awkwardly standing on stage wearing a denim shirt with jeans. At times he takes out a few seconds to metaphorically pop his collar and bask in the coolness of his words or actions. But the most vulnerable moments are when he delivers short and simple lines about love and heartbreak, interspersing comedy with poetry. Comparisons are hard to draw, but when a Hindi comedian from Indore evokes the same level of heart as a performer like Minhaj – an actor and writer for one of the world’s most celebrated satirical news programmes (The Daily Show), there’s only one winner – an audience that has seen two great stories in a span of 50 days.